KHARTOUM IS THE capital city and administrative region of the Republic of the SUDAN, located at the confluence of the Blue and White NILE rivers. 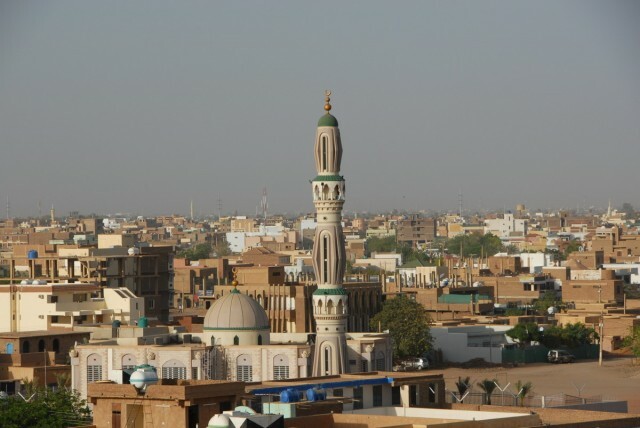 Khartoum is the second-largest city in North Africa, with an estimated population of 2.5 million in the city proper, and up to 7 million in the Greater Khartoum district, which includes Khartoum General, Khartoum North, and Omdurman, each city linked by bridges. Khartoum has a thriving market in cotton products, woven textiles, and knitwear and is a railroad hub that facilitates the transportation of a number of goods, including glass, tile, foodstuffs, gum, and oil. Khartoum has an international airport and two major universities. Khartoum was officially founded in 1821 as an Egyptian army camp and the base of operations for the Ottoman conquest of the Sudan. Muhammad Ali, the Turkish pasha of Egypt, conquered the portion of the Sudan originally controlled by the Funj Empire in order to take advantage of the region’s vast human and economic resources and made Khartoum a depot for the Arab slave trade in Africa as well as a major mercantile center. Khartoum remained under Egyptian military occupation until 1881, when Muhammad Ahmad, the self-proclaimed Mahdi (divinely guided seeker of justice) of the Sudanese people, staged a rebellion that resulted in the city’s liberation. Ahmad and his followers, the Madhists, took advantage of Egypt’s instability in the wake of the British conquest of Northeast Africa but were themselves soon involved in it directly as a British company under General Charles Gordon, who arrived to take the city in 1884. He arrived at Khartoum on February 18, with orders to evacuate a small force of Egyptian soldiers trapped there, but decided to mount an offensive against the Madhist rebels instead, believing that he had the resources to defend the city. Gordon’s tactical error led to a 10-month siege on his company that eventually resulted in his death on January 26, 1885, after the Madhists broke his defenses, destroying much of the city in the process. Khartoum was eventually retaken by the British under Field Marshal Herbert Kitchener in 1898, which marked the advent of joint British and Egyptian colonial rule that lasted until Sudan gained its independence in 1956. The greater Khartoum area has experienced its troubles internally and with the world postindependence. It is houses one of the largest refugee populations in the world, largely the result of civil wars in the region. Oil interests have done little to help the city’s growing problems, especially escalating poverty resulting from overpopulation and lack of resources. Slums are a major problem in Khartoum. In 1998, a pharmaceutical company in Khartoum was bombed by the UNITED STATES, as it was believed to have been a chemical weapons factory for terrorist groups. Khartoum has been regarded as a center for potential terrorist activity, though no direct evidence has been found directly linking the city’s government with any terrorist organization.